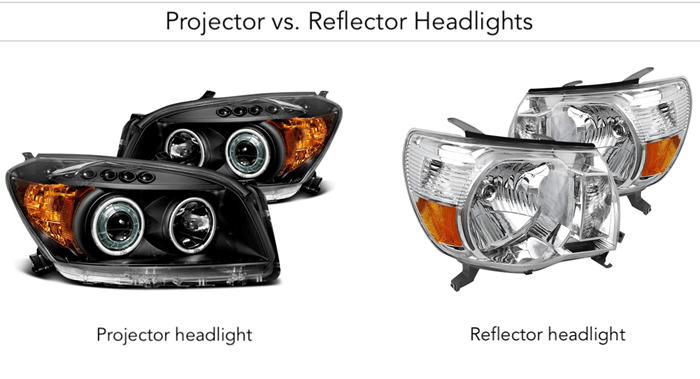 What is the difference between projector and reflector headlights? When looking to upgrade your car’s headlight bulbs from halogen to either HID or LED technology, it is important to know whether your car’s headlight housing employs projector or reflector technology. Although LED technology is newer and more efficient than HID, the type of headlight housing (reflector or projector) will ultimately decide which bulb technology will result in better lighting for your vehicle. If your car is equipped with reflector headlights, it is best to upgrade your lights to LEDs. Although HIDs will fit and work, from experience, they will not perform as expected. In most cases, your stock halogen bulbs will be brighter than HIDs in reflector-type headlights. If your car is equipped with projector headlights, it is best to upgrade your lights to HIDs. 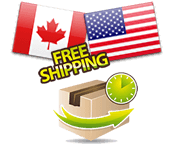 Although LEDs will fit and work, from experience, they will not perform as expected. In most cases, your stock halogen bulbs will be brighter than LEDs in projector-type headlights. 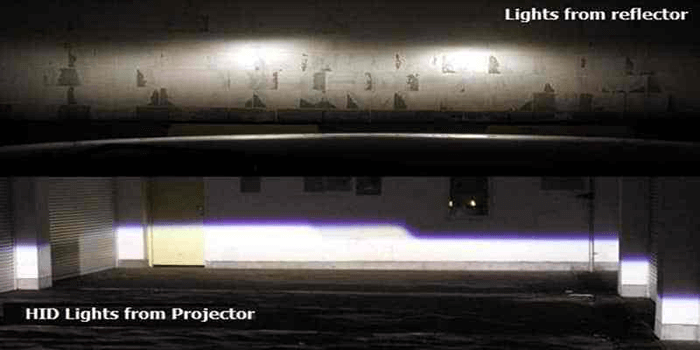 The main difference between reflector and projector headlights is that projectors have lenses that better focus the light as illustrated below. Reflectors will cover a wider angle but the light will be less intense and focused, commonly referred to as having more light ‘waste’. Projectors will emit an intense and focused light thanks to the lens, more on this below. Reflector headlight technology has been in use for decades and is the type of headlight housing found in most cars and trucks, even new ones. Reflectors are cheaper to manufacture and take up less room compared to projectors, which explains why they are still very popular. In reflectors, the headlight bulb is simply mounted in a bowl/cup-shaped housing fitted with chrome paint (reflector bowl), which reflects the light straight onto the road. 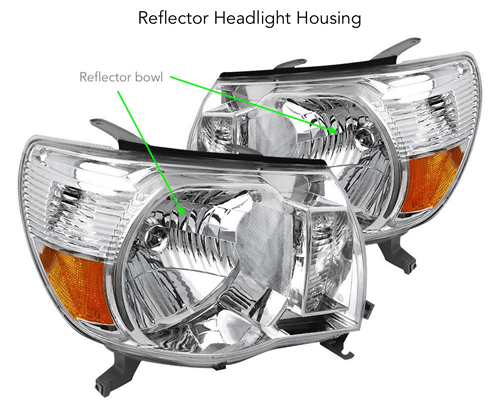 The reflector bowl distributes the light in a wide angle, illuminating the front of the vehicle. The light produced by reflectors is less focused, illuminating a wider range compared to a projector but with less precision and intensity. As mentioned above, LEDs are recommended for headlights with reflector technology. 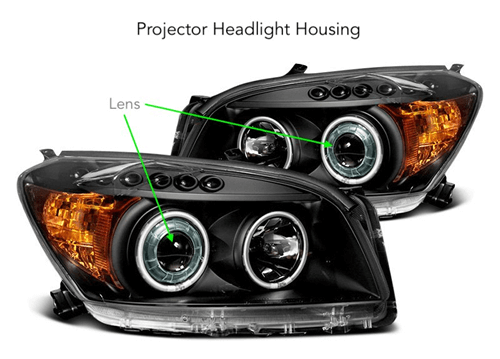 Projectors are a newer type of headlight housing technology that is becoming increasingly popular, especially for higher-end luxury vehicles. The design is very slick and visually appealing. Projector headlights are similar to reflectors in that they both have a bulb that shines in a reflector bowl except that projectors pass the light through a lens before hitting the front of the vehicle. Reflector headlights do not have a lens. 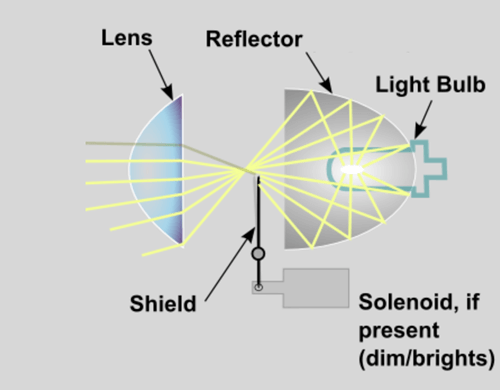 The lens, known as a condenser lens, is used to focus the light. By using a lens, a given bulb will shine brighter and will exhibit less waste. Are reflector headlights better than projector headlights? When looking at the two types of technologies side by side, projectors are definitely preferred over reflectors. Projectors use new and improved technology that results in brighter and more focused light output with less waste. However, when looking to upgrade your headlight bulb to either HID and LED, it is important to remember that LED conversion kits are better for projector headlights and HID conversion kits are better for reflector headlights. Do I have projector or reflector headlights? A common question we frequently get is whether a car has projector or reflector headlights. Chances are your car has reflector headlights but it’s always better to be sure. You can call your dealership or read your car manual, however, it is often pretty easy to determine simply by looking at the headlight, even if you are not a car person. Projector headlights have a very particular look and can be identified by the lens and its clean, simple and modern design as shown below. 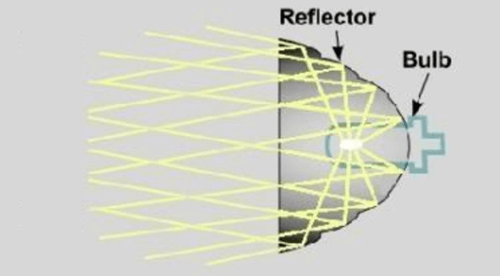 Reflector headlights can be identified by their ‘open’ design, which reveals the reflector bowl (compared to projectors where it is concealed by the lens).